The Materials/Materialen Soundcloud now has a complete recording of WINDSUCKERS & ONSETTERS: SONNOTS for Griffiths, read by Manson and Mendoza. Thanks again to David and Lisa. This entry was posted in books, readings, recordings, Uncategorized and tagged bill griffiths, mendoza, readings, recordings, sonnots, soundcloud on 21/08/2018 by Peter Manson. Blue card covers, 48 pages, side-stapled. £5 inc p&p in UK (£6 Europe, £10 ROW). WINDSUCKERS & ONSETTERS: SONNOTS for Griffiths is a collaborative project between Peter Manson & Mendoza in commemoration of Bill Griffiths (August 20, 1948 – September 13, 2007). The assemblage of ‘niners’ (nine sets of nine lines with nine syllables per line) uses, or responds to, text found in Fishing and Folk: Life and Dialect on the North Sea Coast (2008) & Pitmatic: Talk of the North East Coal Field (2007) compiled by Bill Griffiths. Bill Griffiths was born in Middlesex and settled in Seaham, Co. Durham. Mendoza was born in Northumberland and settled in London. Peter Manson was born in Glasgow and settled in Glasgow. You lose your light. spend all of your lives. Many thanks to David Grundy and Lisa Jeschke. This entry was posted in books, poems, Uncategorized and tagged bill griffiths, books, collaborations, mendoza, niners, pitmatic, poems, sonnots on 16/08/2018 by Peter Manson. There are four of my translations from Mallarmé (“…Mysticis umbraculis”, “Sonnet to Valère Gille”, “Macabre gallantry” and “The prodigal son”), a poem translated from Verlaine (“Hour of the shepherd”) and an untitled poem by me in MOTE 1, ed. Dominic Hale, Maria Sledmere and Ryan Edwards (Edinburgh, July 2018). Many thanks to the editors. This entry was posted in books, magazines, mallarmé, poems, translations, Uncategorized, verlaine and tagged magazines, mallarmé, poems, translations, verlaine on 11/08/2018 by Peter Manson. I’ve edited a pamphlet anthology of current Scottish poetry for Martin Corless-Smith’s FREE POETRY imprint in Boise, Idaho. The poets included are Dorothy Alexander, Christina Chalmers, Calum Gardner, Katy Hastie, Colin Herd, MacGillivray, nick-e melville, Iain Morrison, Nisha Ramayya and Kathrine Sowerby. The publisher encourages the reproduction of this chapbook and its free distribution, ad infinitum. Thanks to Martin, and to Colin Johnson and Tessy Ward for their work on the anthology. This entry was posted in anthologies, books, pdfs, poems, scottish poetry, Uncategorized on 14/03/2018 by Peter Manson. 20pp A5, £3.00 including UK p&p (£4.00 rest of world). November 2016. Click here for a sample poem. Many thanks to Calum Gardner. This entry was posted in books, Uncategorized and tagged booklets, books, poems on 28/11/2016 by Peter Manson. New from Free Poetry in Boise, Idaho: a selection of scenes and fragments from the unfinished mystery play “Les noces d’Hérodiade” by Stéphane Mallarmé. 31pp A5. All booklets in the Free Poetry series are issued free of charge and without copyright, and the editor encourages the reproduction of this chapbook and its free distribution ad infinitum. Many thanks to Martin, and to Colin Johnson for the great (and difficult) typesetting job. 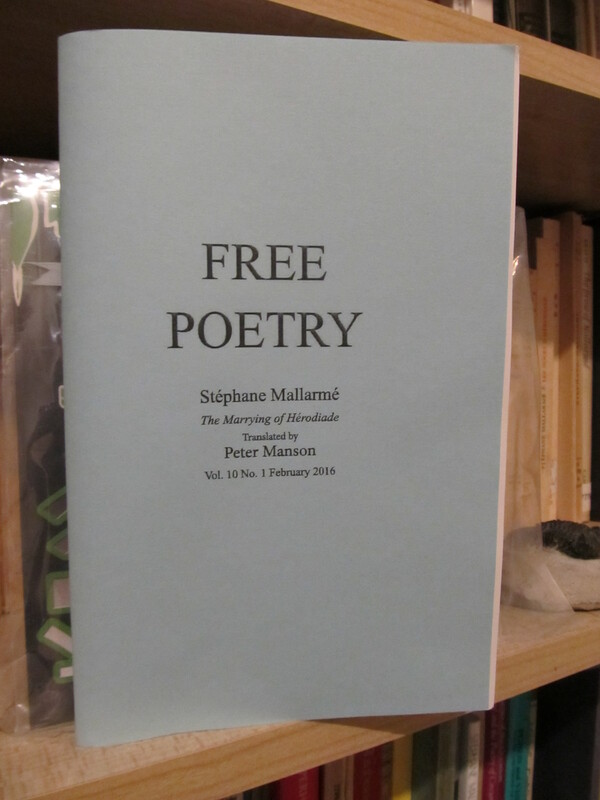 This entry was posted in books, mallarmé, translations and tagged booklets, books, free poetry, hérodiade, mallarmé, translations, wonky first drafts on 09/03/2016 by Peter Manson.